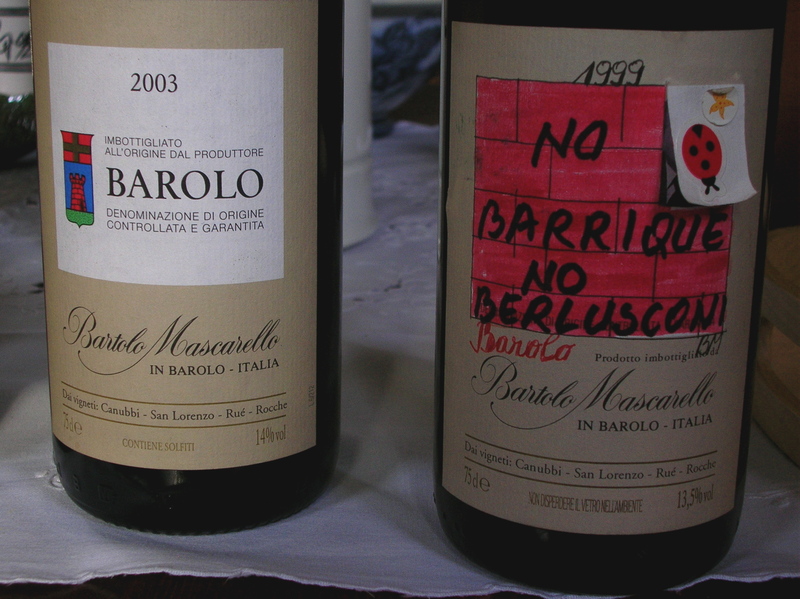 I snapped this picture of the infamous “No Barrique, No Berlusconi” bottle during a visit with Maria Teresa Mascarello at Bartolo Mascarello’s winery in Barolo two weeks ago. * It was out on the table in the homey room at the front of the winery where Maria Teresa receives visitors, a quiet yet poignant political statement in advance of the Italian elections. Well, those elections happened over the weekend and, I’m sorry to say, Berlusconi has been returned to power. As this article in today’s New York Times points out, he was able to do so in part because of the support of the Lega Nord, or Northern League. The one on the left is fairly obvious (“Enough with taxes, enough with Rome”). 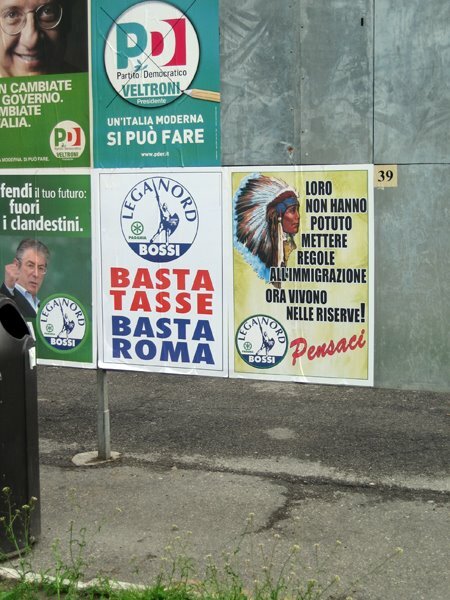 It’s the poster on the right that has me the most disturbed, with the image of an American Indian and the phrase “Loro non hanno potuto mettere regole all’immigrazione, ora vivono nelle riserve!” Loosely translated it reads “They didn’t have immigration laws and now they live on reservations!”. *See my earlier post about the collapse of Prodi’s government (which brought about this early election in the first place), and a mention of Mascarello’s famous label. *By way of background, Wikipedia has a succinct article on the Lega Nord here. This entry was posted in italy, rants and tagged Bartolo Mascarello, Italian 2008 Elections, Lega Nord Indian Poster, Maria Teresa Mascarello, No Barrique No Berlusconi, politics. Bookmark the permalink. ← Fanning the Flame of Freedom?